For dogs over 25kg. This pack contains 3 vials which are to be applied to the skin at the back of your dog's neck. This is Australian registered product labelled in kilograms.Specific product information can be found by clicking more info and the detailed product specifications link. 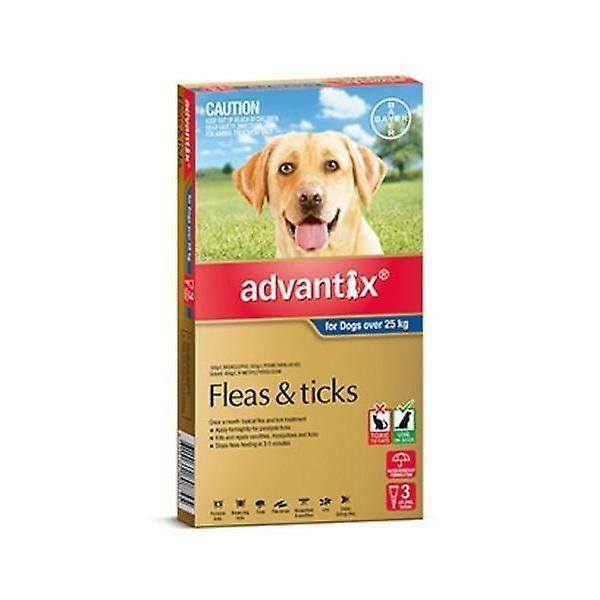 Advantix® is a once-a-month topical flea, tick, and mosquito treatment for dogs and puppies 7 weeks of age and older.Advantix® repels and kills mosquitoes before they can bite Kills fleas & ticks fast.Keeps working after swimming or bathing.Not for use in Cats. Do not apply to cats or animals other than dogs. Do not permit cats to actively groom or have close physical contact with a recently treated dog. If applied to a cat or ingested by a cat this product may have serious harmful effects. Advantix® is a registered trademark of Bayer A.G. Leverkusen, Germany.